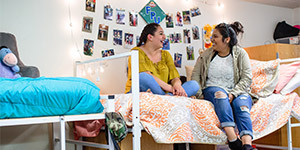 At Fresno Pacific University, you’ll join others who are united by a passion for knowledge, fellowship, and faith. Through a challenging liberal arts education driven by values rooted in the Christian faith, you’ll gain the confidence and determination to succeed in your career and in your life. Our 50-acre campus is located in Fresno, in the heart of California’s Central Valley and within a short drive of mountains, beaches, and national parks. Discover Fresno’s thriving arts, food, and music scene as you enjoy more than 300 days of pure sunshine a year. Whether you’re living in our campus dorms, apartments, or houses, you’ll never be more than a couple steps away from the excitement. 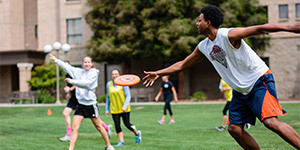 Attend a weekend retreat, join a club, grab a frappe at Charlotte’s Coffee Corner, or start a game of Frisbee on the campus green—you’ll always find someone ready to join you. Spiritual life is woven into the fabric of our community—it’s part of our classes, residence halls, and extracurriculars. Grow in your faith by attending chapel services, joining a ministry team, or studying the Bible with your friends. Whether you prefer a traditional worship service or a talk series focused on current issues, you’ll find it at FPU. We have more than 100 areas of study with 35 majors and 35 minors, and we provide numerous study abroad opportunities and internships where you’ll gain invaluable hands-on experiences in the field you’re called to. Create, study, and experience the arts through a variety of academic and extracurricular opportunities, including choirs, theater productions, and music ensembles. Take advantage of our new Software Engineering major and get ahead in today’s fast-paced technology industry. More than 80% of our professors are experts in their fields and hold PhDs, meaning you’ll learn from the very best no matter what you choose to study. Our small class sizes and student-faculty ratio of 13:1 allow professors to get to know you and truly invest in your life—challenging, mentoring, and pushing you to be your best. Talk about a new research idea over lunch or meet up during office hours. Our faculty are excited to teach you and help you prepare for your future career. 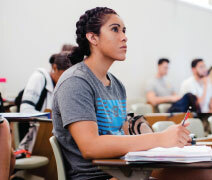 Put yourself to the test not only in the classroom but also on the field, court, track, or pool as an FPU Sunbird athlete. We compete in the NCAA Division II Pacific West Conference and have 15 teams, over 52 national titles, and 309 student-athletes—111of whom have achieved academic honors. We want to ensure you stay focused on your education while we focuson making sure you can afford it. We’ve awarded more than $29 million annually to our students, 98% of whom receive some form of financial aid. Our financial aid resources include scholarships, grants, and loans, which go all the way up to full tuition. And with our Four-Year Graduation Guarantee, you’ll get a head start toward achieving your personal goals. If you’re not able to graduate in four years, your necessary coursesare on us! Come to our campus and experience the unique blend of people and place first hand—you’ll feel it the moment you arrive. ExperienceFPU.com/Visit has everything you need to know to schedule a personal visit or sign up for one of our many visit events throughout the year.